Create the perfect outdoor living space with a custom built deck from Forsyth Structures. No matter the size, style, or materials you want for your deck, our team can create a deck you’ll relax on for years to come. A custom porch or sunroom from Forsyth Structures gives you the beauty of the outdoors with the comfort of being indoors. Let us help you build a porch to enhance your home. Bring elegance and tranquility to your backyard with a custom raised bed garden, gazebo or backyard bridge from Forsyth Structures. Let Forsyth Structures help you with your next commercial construction project. Whether we build it from the ground up or provide upfit services, our experienced team is ready to complete your project on time and within budget. We are a partner first, and that makes all the difference. As a premier residential and commercial contractor, Forsyth Structures is backed by 25 years of experience bringing the most complex projects to life. Whether you are dreaming about an addition to your home or developing a commercial site, you need a construction partner you can trust. Forsyth Structures holds an unlimited building license and is fully insured to protect you. 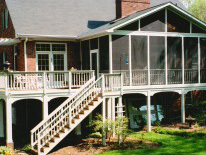 Forsyth Structures has been improving homes in Winston-Salem, North Carolina since 1999. 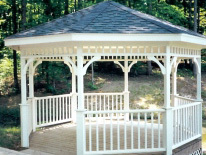 We specialize in helping our customers create a variety of additions to their homes. 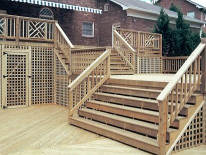 Beautify your outdoor living space with a custom built deck, raised bed gardens, sunroom, screened porch or gazebo. Owner John Deal oversees each project every step of the way to ensure you are completely satisfied. Need a little inspiration? Visit our residential gallery to learn more about our residential services. Forsyth Structures is a commercial licensed general contractor. We offer commercial construction to Winston-Salem and the surrounding area. Our mission is to provide clients with a high quality, cost effective project, delivered on time. Our client list spans local to national businesses and includes both the public and private sectors. Learn more about our work in the commercial construction market, by visiting our commercial gallery. We also offer Office and Retail Maintenance performing repairs, painting, remodeling and general maintenance services. Enjoy the comfort of your home combined with the beauty of your back yard. Discover the luxury of a custom deck built to fit your lifestyle and yard. Few things are better than spending a North Carolina summer evening in your own gazebo. 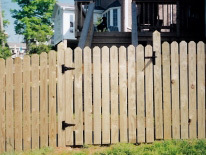 Custom built wood fences that blend in with your yard while adding a level of privacy.